MQ2AutoLogin is a core Macroquest2 plugin that automatically logs in your characters. 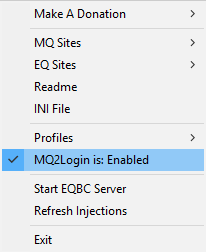 Type "/plugin mq2autologin" in-game to load, it will stay loaded for all future logins. 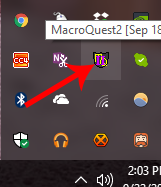 Using MQ2 as a standalone launcher is secure, simple, and able to organize hundreds of characters through custom groups. 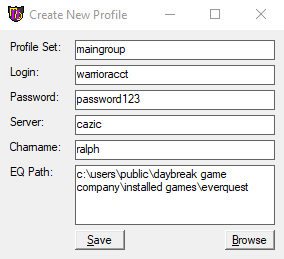 Your EverQuest login information is encrypted and stored locally, unique to your computer. If you try to transfer the login file between PCs, or change your PC's hardware, your login information can't be read. Be sure to use the import/export feature beforehand in those cases. Make sure MQ2Login is enabled. If not, click it to enable. Fill in the information and save. Important: "Server" must use a special shortname. That's it, now you're ready to run. and click the character name. and click "load all". All characters with a checkmark will be logged in. To add or remove a checkmark, right-click -> check. To edit a character profile, right-click -> edit. Profiles are encrypted and saved in mq2autologin.ini. The information will be rendered unusable if you switch computers, or make hardware changes to your current computer. To transfer between PCs, use the export/import feature. The Hot Key will immediately bring that character to the front, whether you're playing EQ or browsing the web. It can be a minimum of 1 character and maximum of 3 characters, separated by a + You may need to restart MQ2 in order for it to work. Other settings are explained below. The following method stores your account information in MQ2AutoLogin.ini in plaintext. NEVER SHARE OR POST THIS FILE! Then load the game with either the normal launcher, or the patchme method, and your character will be logged in. The first window will open session1, the next window session2, and so on. 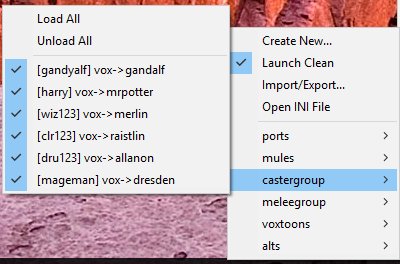 You can also use station names rather than sessions, this is handy for ISBoxer / WinEQ2 users. Then load the game with whatever launcher you prefer. UseMQ2Login (from MQ2AutoLogin.ini) Defaults to 1, must be set to 0 if using the 2nd or 3rd login methods or your game will sit at the login screen. KickActiveCharacter (from MQ2AutoLogin.ini) defaults to 1 (on) if it's not in your ini file. If enabled, this clicks the "Yes" button when the window pops up asking if you want to kick the character that you already have logged into a world server, else it just sits there at the server-select screen. UseStationNamesInsteadOfSessions (from MQ2AutoLogin.ini) defaults to 0 (off) if it's not in your ini file. If enabled, this uses account information based on the specified station name, which works well if you're using WinEQ2 profiles. The sessions are for each account you want to load up. So if you have three accounts, you'll put in entries for Session1, Session2 and Session3, each with its own account information (station name, password, server name, character name). /switchcharacter when issued in game, logs you out of one character and into another on the same server. NotifyServerUp (from MQ2AutoLogin.ini) will alert you as soon as the server is up. NotifyOnServerUP=1 will BEEEEEEEEEEEEEEEP when server is up. NotifyOnServerUP=2 will also email you if you have the mq2gmail plugin loaded and correctly configured. Holding down the END key while starting EQ will bypass the auto-login routine. CycleNextWindow=shift+` When you press shift and `, it cycles to the next window. Maximum of two keys. CycleNextWindow=0 Disables next window cycling. CyclePrevWindow=shift+\ When you press shift and \, it cycles to the previous window. Maximum of two keys. CyclePrevWindow=0 Disables previous window cycling. If you'd like to make a batch file or hotkey to login, it's simple. This example assumes you HAVE profiles created with "Create New..." in mq2autologin.ini and MQ2 is already loaded. and as long as there's a server LONGNAME that matches what you see in the server select list, your shortname will work. This is particularly useful on emulator login servers that assign dynamic IDs. See the example above on how to add the Brekt (Free Trade) server.